Real grass can be hard to maintain, and quite costly to do so. Sometimes, no matter how much you mow, water and fertilize, you just can’t get your grass areas to grow green and healthy. Have you ever wanted to build a personalized putting green? Do you love golf and want to be able to practice at any time of the day or night? Turn your dreams into reality with a custom-design. MAE Landscaping’s residential landscaping is the perfect way to enhance the beauty of your Seattle home. A custom landscape design can turn your yard into the envy of the neighborhood. Whether you’re inquiring about landscaping for a school, park, bank, shopping center or any other commercial area, we have the experience you need for your project. 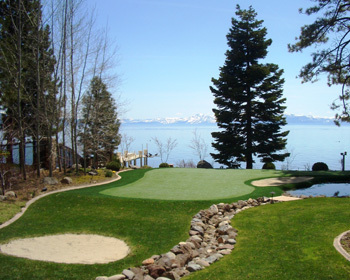 Southwest Greens Seattle designs and installs golf putting greens formulated from the finest artificial turf and synthetic grass products on the market. From indoor putting areas to backyard transformations, your personal putting greens will be envied by neighbors across Washington State! Imagine practicing your short game in your backyard before hitting the local golf course. Our custom design, signature lawn installation, and state-of-the-art construction will have you ready to perfect your putt in four weeks or less! Our putting and golf greens are unlike anything you have previously seen, felt or played on before. Southwest Greens Seattle’s revolutionary synthetic grass blend along with our outstanding design team set us apart from the competition. Look no further than the residential and commercial installation professionals at SWG Seattle for your next indoor or outdoor putting greens project. 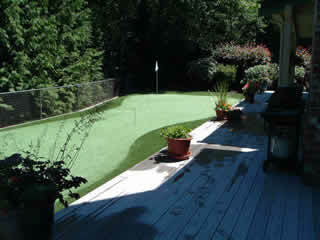 In addition to being a backyard feature that the whole family can enjoy, SWG Seattle’s putting greens will never fade. Stop wasting your time watering, mowing, fertilizing, and maintaining your lawn. Seattle’s climate means that your sod grass will be green for only a few months out of the year. 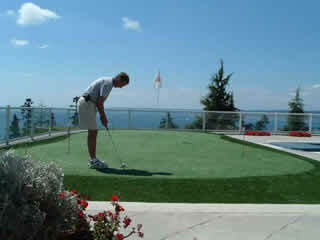 Enjoy a luxurious, evergreen synthetic grass lawn to practice your golf game throughout the year. Southwest Greens in Seattle, Washington, guarantees your satisfaction with your indoor or outdoor putting green design and installation. 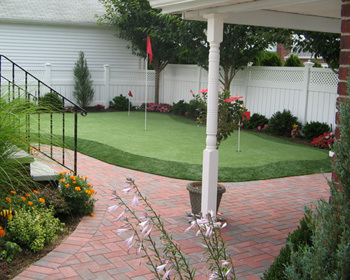 Transform your mundane backyard into the premium golf putting greens you have always dreamed about. Duane Diede has owned and operated MAE Landscaping, Inc. since 1976. He has been installing high quality landscapes and irrigation systems for residential and commercial areas for years. His Horticulture degree and years of experience as a serious golfer is what makes his business different from the others. Diede qualified and played in the 2004 US Senior Open as an amateur, and if anyone knows what a professional green should feel like, it would be Diede. 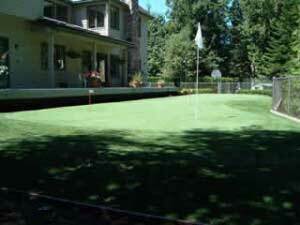 With Southwest Greens Seattle’s putting greens, you can have your practice greens and practice anytime you want. It’s your area; why not have fun with it? Real grass can be hard to maintain, and quite costly. Sometimes, no matter how much you mow, water and fertilize, you just can’t get your grass areas to grow green and healthy. Southwest Greens Seattle has a solution to all of your grass problems. 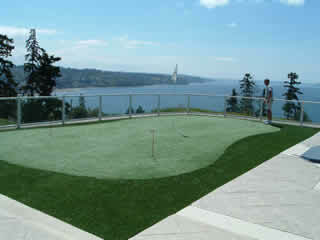 Southwest Greens Seattle can install artificial turf for your tee lines. The constant divots and club damage can make real grass tee lines difficult, if not next to impossible, to maintain. Not to mention how costly they can be. Southwest Greens Seattle can build a golf green, putting green or indoor putting green for both residential and commercial areas. Our commercial applications are custom designed to fit your space. Precision Landscaping is the perfect way to enhance the beauty of your home. Duane Diede has helped residential homeowners by designing irrigation systems to help grow and maintain beautiful and healthy green grass and nourish plant and flower life. Whether you’re looking for landscaping for a school, park, bank, shopping center or any other commercial area, Duane Diede has the experience and professionalism you need. Landscaping for commercial areas can improve the aesthetic beauty of your building.